A couple from Gwendraeth Valley has hit it big in the Euromillions Lottery, and they did not even have to join a queue to purchase their entry. 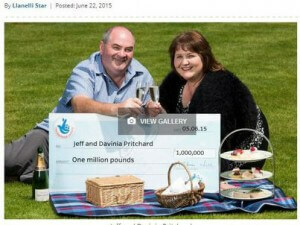 Online players Jeff Pritchard and wife Davinia have won £1 million from the EuroMillions UK Millionaire Maker draw on June 5. The couple couple play the lottery regularly. They purchase two EuroMillions entries online every Tuesday and Friday, and two Lotto entries for Wednesday and Saturday. But when Pritchard received the notification email, he initially thought it was just spam. Now that things have settled down a bit, they have decided to upgrade a planned vehicle purchase to a new Audi Q5. They are also undertaking renovations on their home.